We use the Canadian Community Health Survey (CCHS) to explore the effects of marriage and cohabitation on gay, lesbian, bisexual and heterosexual individuals' hours worked and full-time earnings. The CCHS is one of the largest national-level data sets containing both income and sexual orientation information (Carpenter, 2008). Partnered gay and bisexual men spend more hours in paid employment than their unattached counterparts. However, for those working more than 30 hours per week, the earnings advantage of partnered gay and bisexual men relative to the unattached is insignificant. The hours worked of partnered and unattached lesbians are indistinguishable, however partnered lesbians earn about ten percent more than the unattached. Bisexual men and women experience some of the worst labor market outcomes of any group. These findings suggest that caution should be employed when generalizing results based on studies of cohabiting gay and lesbian couples to the entire non-heterosexual population. Lafrance, Amélie, Warman, Casey, & Woolley, F. (2009). 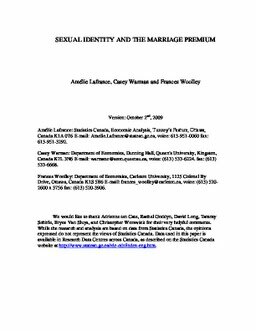 Sexual Identity and the Marriage Premium (No. CEP 09-08). Carleton Economic Papers (CEP). Department of Economics.